Staff of Bank of Kigali (BK) Group has paid homage to genocide victims including their former employees who were killed during the 1994 Genocide against Tutsi. 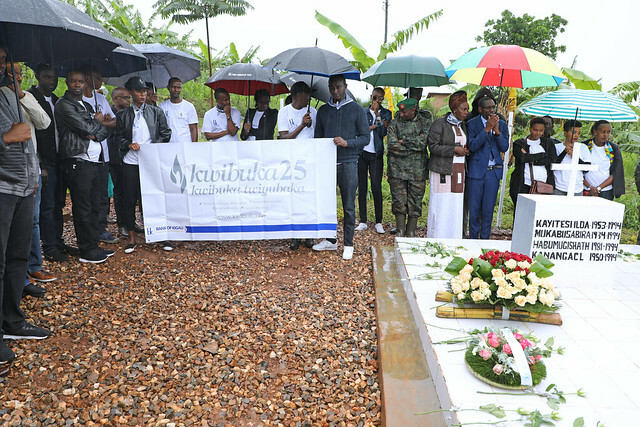 On April 12,2019, led by Dr. Diane Karusisi, the bank’s Chief Executive Officer (CEO), BK Group staff laid wreaths and paid their respect to victims at the Ntarabana Genocide Memorial site in Rulindo district, Northern Province. 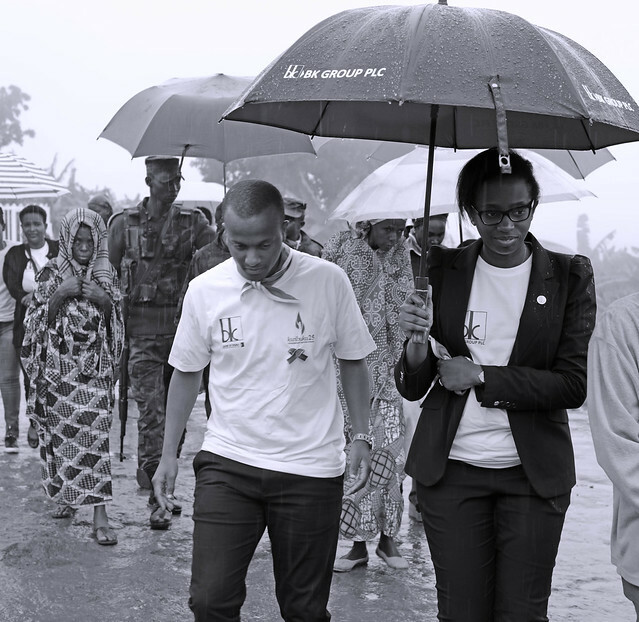 The visit was part of the 25th genocide commemoration (Kwibuka25) in which the bank also extended support to 100 families of vulnerable genocide survivors in the area where at least 18,762 Tutsi were killed on the hills of Rulindo district. Bank of Kigali staff handed over 100 solar energy gadgets to families of survivors living in Ntarabana, Kinzuzi and Burega sectors who have no access to electricity. They also rehabilitated 16 houses. The donation, worth Rwf70million was aimed at helping beneficiaries to get access to a better living condition and welfare just like other Rwandans living in the surrounding area. The genocide commemoration event and support to survivors are part of the bank of Kigali’s commitment to supporting vulnerable Rwandans and the economic transformation of the country. Karusisi said that there is a possibility of additional funding for water tanks as requested by the beneficiaries. One of the beneficiaries, Emmanuel Urimubenshi, 36, was eleven year old when the genocide happened. “I have for long had only one concern of having a decent house to live in. Now I have gotten it, thanks to bank of Kigali,” Urimubenshi said. The Mayor of Rulindo Emmanuel Kayiranga said that the district is finalizing construction of 32 housing units destined to vulnerable genocide survivors who have no shelter. The project is worth Rwf600 million. As part of its Corporate Social Responsibility (CSR), BK Group, in collaboration with government, has previously in every year selected needy families and supported them with cows, in line with the President’s ‘Girinka’ initiative that is aimed at transforming people’s lives financially. For example, in Nyanza District – Southern Province, the Bank donated 15 Friesian cows and built 15 kraals survivors. While visiting Ntarama Genocide Memorial Site in Bugesera District, Eastern province, the Bank offered 10 cows to Genocide survivors. 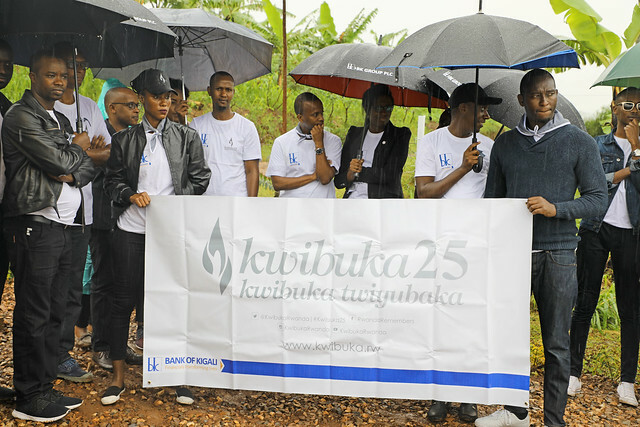 Last year, the bank staff supported 15 families of genocide survivors in Gitesi sector, Karongi district with 15 cows as part of Kwibuka24.